So the results of my poll were varied enough that I am NOT going to be inundating you with tons of new posts about sewing, costumes, and anime/TV. However, I will be doing SOME. I'm going to start a new feature called TV Tuesday. I don't know if I'll do this every Tuesday, or if this will be the only one. But I like TV/Movies, and I want to talk about them. This first TV Tuesday is book themed, but I can't promise it always will be. 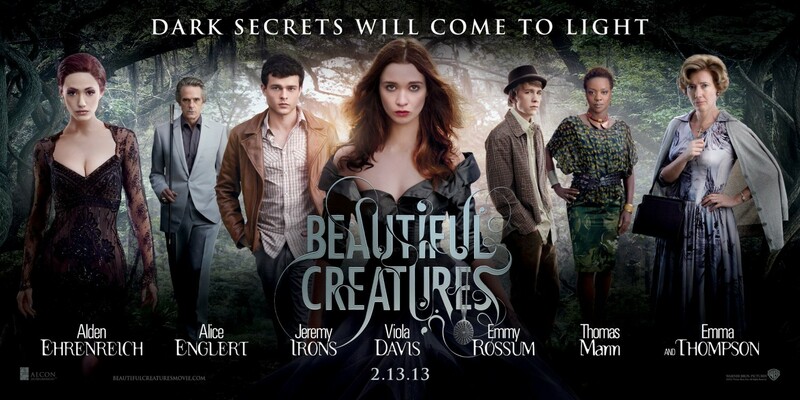 Without further ado, let's talk about the travesty that was the Beautiful Creatures movie. Now, I ADORE these books. I've only had a chance to read #1 & #2, but I own all of them and can't wait to get to them. I was really excited to see this movie, but wasn't able to see it in theatres. So last week I rented it and watched it with my mom. When the movie was over, my mom asked me "Do you think it was a good movie?" And honestly, I couldn't answer her yes or no because I was too distracted on how TERRIBLE an adaptation it was. I'm not going to talk about the acting, I'm not going to talk about the effects or the dialogue. I'm gonna stick with what I know best, which is books. It was almost like the movie was based on the book, but not quite. So many things were off that I just basically sat with my mouth open the whole time. I had no idea what was going on. I won't list specific things that were off, because I don't want to spoil the book for those who haven't read it. Imagine you are listening to the radio, and your favorite song comes on. You start singing along (because OF COURSE you know all the words), and because you're singing along it takes you a while to realize that the words coming out of your radio are not the same words coming out of your mouth. But because you were singing, you have no idea what words WERE coming out of the radio. And suddenly you're just lost and confused. What happened to your song?! That's how I felt about this movie. So when my mom asked me "Do you think it was a good movie?" I had no idea. Because I was so distracted by what I expected to happen, that I couldn't even comprehend what actually happened. Usually I have to explain things to people after we see book-movies. Because there are holes in the plot that I can fill in having read the book, but they can't. It was the opposite with this one. My brain kept trying to fill in the holes that the movie made, but then the movie would fill it in with something else. The result: brain overload. Just to let you know, my mom did like the movie. She didn't love the movie, but she said she liked the story well enough. So if you haven't read the books, maybe you'll like the movie. THEN GO READ THE BOOKS. If you have already read the books and you watch this movie... buckle up. Don't be like me and expect to see the story adapted. Just go in expecting to see a movie and maybe you'll do better. What about y'all? Did anyone see this? Have you read the books? What did you think? I haven't seen the movie yet or read the book. I usually read the book first but if they are so different I think I'm going to watch the movie first. *gasp* I never do that. I'll let you know if I like the movie because of that :) Thanks for the advice.